The OSCE’s main mission to Georgia expired at the end of 2008, but the organization continued to be represented by 20 unarmed military monitors on a mandate that expires on June 30. Russia has scuppered negotiations on extending their mandate, and has denied them access to South Ossetia since the war. Earlier this month, Russia also vetoed the extension of the UN mission in Georgia. The UN team had been monitoring the ceasefire along the border between Georgia and Abkhazia since the end of the war. MOSCOW (Reuters) – Russia launched large-scale military exercises involving thousands of troops across parts of its southern regions on Monday which Georgia said would violate its territory. The Defence Ministry said the sweep of the week-long “Caucasus 2009” manoeuvres would include the volatile, mainly-Muslim regions of Chechnya, Dagestan and Ingushetia – continuing focus of rebel groups seeking to prize the area from Moscow’s control. Moscow sees the Caucasus mountains area as a strategically vital zone, the approach to prime agricultural and industrial regions and an important energy transit route. The exercises are due to end on July 6 when U.S. President Barack Obama arrives in Moscow for summit talks with Medvedev. General Vladimir Boldyrev, commander of Russia’s Ground Forces, was quoted by Izvestia newspaper as saying the exercises would involve military bases in South Ossetia and Abkhazia, which Russia has now recognized as independent of Georgia. and then there’s the contest over the Ukrainian port that Russia resents having to rent when it seems it is already theirs . . .
SEVASTOPOL, Ukraine — As the Kremlin seeks to reassert its sphere of influence around its borders and beyond, this home port for Russia’s Black Sea fleet — marooned in the south of Ukraine after the breakup of the Soviet Union — has moved to the center of tensions between Russia and U.S. allies in the region. Georgia and Ukraine, with American backing, angered the Russian leadership with their NATO aspirations. If they were to join, Russia’s Black Sea coastline would be surrounded by members of the military organization. Sergei Zayats, the administrator of Sevastopol’s largest district, said he thought the Russians would be willing to resort to force to keep their ships docked in Crimea, where their fleet has operated since the 1780s. “The events in Georgia show that this may happen at any time,” said Zayats, who was appointed by Kiev. Suggestions that Ukraine may want the fleet to leave sooner — a potentially crucial step in its NATO efforts — have been ignored. Ukrainian court orders to hand over control of more than 70 lighthouses, antennae stations and navigational sites in Crimea and nearby areas also have been brushed aside. While the Russian government denies issuing passports to residents of Crimea, a tactic used in Georgia to bolster claims that the Kremlin had to save its citizens there, the prosecutor’s office in Sevastopol says that an investigation that started two months ago already has found 1,500 residents with both Russian and Ukrainian passports, in violation of Ukrainian law. Some of those passports were from the early 1990s, when the question of statehood was unclear, but others were issued during the past few years, said Alexander Rubstov, an official in the prosecutor’s office, who didn’t say how many passports fell into each of those categories. Rubstov said the inquiry in the city of about 430,000 residents still had a long way to go, and the numbers could rise. Roman Zvarych, a top official in Yushchenko’s Our Ukraine party, said he thought Russia had passed out “something in the neighborhood of several tens of thousands” of passports in Crimea, a charge Moscow has denied. The tension over Crimea is complicated by the intertwined histories of Ukraine and Russia. The region belonged to Russia until 1954, when Soviet leader Nikita Khrushchev handed it over to Ukraine. At the time, the difference was largely semantic, but when the Soviet Union collapsed in 1991, many in Crimea would have rather not become part of an independent Ukraine. After the disintegration of the USSR, Ukraine found itself in possession of the world’s third largest nuclear arsenal. There were 176 launchers of intercontinental ballistic missiles with some 1,240 warheads on Ukrainian territory. This force consisted of 130 SS-19s, each capable of delivering six nuclear weapons, and 46 SS-24s, each armed with ten nuclear weapons. An additional 14 SS-24 missiles were present in Ukraine, but not operationally deployed with warheads. Several dozen bombers with strategic nuclear capabilities were armed with some 600 air-launched missiles, along with gravity bombs. In addition, as many as 3,000 tactical nuclear weapons rounded out an arsenal totalling approximately 5,000 strategic and tactical weapons. From the first days of its independent development, Ukraine affirmed three basic principles — not to accept, manufacture or acquire nuclear weapons. The West remained concerned with the nuclear aspects of Ukraine’s problems with weapons proliferation. Western sensitivity over nuclear issues convinced Ukraine’s leaders that they could influence the West by using the nuclear lever. The Declaration on State Sovereignty adopted by the Parliament of the Ukrainian SSR on 16 July 1990 defined the building of the army as a major task and a natural right of the future Ukrainian independent state. By announcing the right to maintain its own army, Ukraine took a significant step toward independence from the USSR. The military coup in Moscow in August 1991 and fears that Soviet troops on Ukraine’s territory would act aggressively against the Ukrainian state led the official leadership in Kiev to subordinate these troops to the control of Ukrainian authorities. Ukraine also announced as its own the Soviet military property on the soil of the newly independent state. Ukraine inherited about 30 percent of the Soviet military industry, which included between 50 and 60 percent of all Ukrainian enterprises, employing 40 percent of its working population. Ukraine was, and remains, the leader in missile-related technology, especially guidance systems, navigation electronics for combat vessels and submarines, and radar for military jets. Strong competition in the world’s weapons market forced Ukraine to look into exporting arms to politically unstable or even aggressive regimes. Ukraine established its own network for arms export and, in so doing, did not fully recognize international rules and bans. The Ukrainian military traded conventional arms on the black market and signed contracts with commercial firms. The first contracts on weapons deliveries to Iran, signed in the middle of 1992, and caused negative reaction in the West (particularly in the US). On 13 May 1994, the United States and Ukraine signed a Memorandum of Understanding on the Transfer of Missile Equipment and Technology. This agreement committed Ukraine to adhere to the Missile Technology Control Regime (MTCR) by controlling exports of missile-related equipment and technology according to the MTCR Guidelines. Ukraine has a sufficient amount of highly enriched uranium, which the United States wanted to buy from the Kharkiv Institute of Physics and Technology. Ukraine also has two uranium mining and processing factories, a heavy water plant, a technology for making electronic to determine the isotopic composition of fissionable materials. Ukraine has deposits of uranium that are among the world’s richest. Ukraine initially announced its intention to obtain operational control over the strategic nuclear weapons deployed in its territory. Responding to these intentions, Russian military officials responded that attempts to interfere with, or to damage the command and control systems of, Russian strategic troops located abroad would constitute a direct military threat to Russian Federation. Originally Ukrainian leader Leonid Kravchuk was “not worried” if nuclear weapons went to Russia for decommissioning. Gradually, however, his worries developed sufficiently to lead to him to reverse his position and on 12 March 1992 to suspend temporarily the transfer of tactical nuclear weapons to Russia. However, in conformity with the 16 July 1990 “Declaration of State Sovereignty” and other agreements signed at the creation of the CIS, by May 1992 Ukraine voluntarily removed all tactical nuclear weapons [approximately 3000] inherited from the former Soviet Union. The trilateral agreement signed in Moscow on 14 January 1994 by the United States, Russia, and Ukraine was seen as a significant Western success in disarming Ukraine of nuclear weapons. Under the agreement, the Russian Federation undertook to send 100 tons of fuel to Ukraine for its nuclear-power plants. The United States agreed to pay $60 million to the Russian Federation in support of that process. For its part, Ukraine agreed to transfer 200 nuclear warheads over a 10-month period. 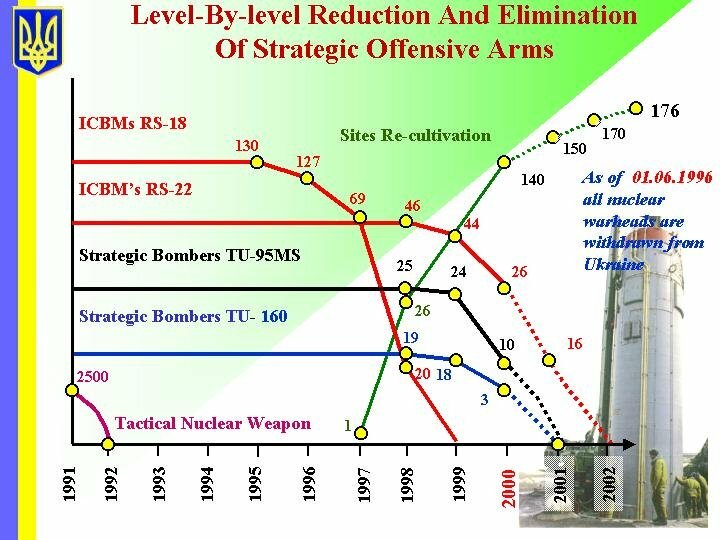 As of May 1994, 120 SS-19 Stiletto and 60 SS-24 Scalpel intercontinental ballistic missiles had been shipped out of Ukraine for reprocessing in Russia. Ukraine announced in June 1996 that all warheads bad been removed from the country. A problem arose in the removal of SS-19s, which use large amounts of a toxic substance known as heptyl. The United States sent storage tanks to hold 2,200 metric tons of the substance. After the SS-19 missiles were removed from combat duty, 19 were re-used in Russia. The Strategic Nuclear Arms Elimination in Ukraine – SNAE (U) program in Ukraine was structured to support Ukrainian participation in START I Treaty implementation and facilitate the destruction of WMD delivery systems. The program is conducted in accordance with the Implementing Agreement between the Department of Defense (DoD) of the United States of America and the Ministry of Defense (MOD) of Ukraine Concerning the Provision of Material, Services, and Related Training to Ukraine in Connection with the Elimination of Strategic Nuclear Arms dated December 5, 1993. In 2002, a Ukrainian proposal was submitted to split Executive Agency between the MOD and the National Space Agency of Ukraine (NSAU), with the MOD handling military issues and NSAU handling ICBM and associated fuel elimination and part storage. 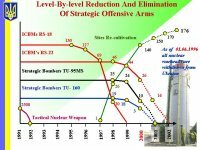 At completion of the SS-24 Weapons System Elimination and Bomber & ASM Elimination programs, all strategic nuclear arms of Ukraine will have been eliminated and the overall objectives of the SNAE (U) program will have been met. The U.S. Department of Energy’s International Nuclear Export Control Program [INECP] provides support to the State Department’s Export Control and Border Security Program’s (EXBS) nonproliferation goals by focusing resources on cooperative projects in the three themes that guide its domestic program: licensing, industry outreach, and enforcement. In Ukraine, INECP provided support to licensing activities for both of the country’s premier nuclear institutes—the Institute for Nuclear Research (INR) and the Kharkiv Institute of Physics and Technology (KIPT). Support for the Nuclear Export License Review System (NELRS), a computer-based system designed to facilitate the technical review of license applications, is ongoing. A second automated system, the SSECU departmental database, was also developed with INECP support. This database is used by the Nuclear Item Review Department of SSECU to review past licenses and access reference materials. In Industry Outreach, American experts joined with representatives of INR and KIPT, as well as Ukraine’s State Service for Export Control and the Science and Technology Center (STC) in providing presentations on technology transfers and technology security, commodity classification, and internal compliance for the nuclear industry in Ukraine . In the area of enforcement, the George Kuzmycz Training Center completed the first step of developing a training course for the State Customs Service of Ukraine (SCSU) by completing a curriculum deliverable accepted by SCSU. The Kuzmycz Center, it was agreed, will develop the training courses and begin training SCSU in FY 2003. Prior to 2003 – it is 2009 now. “If Kosovo was selected to be the staging post for the launch of international terrorism in the Balkans, then Chechnya is the equivalent in the Caucasus. With [outside] assistance, enforced on the population of this Russian republic has been created an anti-people, anti-constitutional, criminal regime…a criminal-terrorist enclave. The men who are literally in the front line waging Russia’s present “counter-terrorist campaign” are operating from the North Caucasus Military District (MD), Russia’s main guarantor of her security interests in the south. Using their methodology, three operations were deemed to have been “a total failure”: Tbilisi, April 1989; Vilnius, January 1990 and, not surprisingly, Chechnya, December 1994-August 1996. The U.S. Nuclear Regulatory Commission is the federal agency responsible for protecting public health and safety with regard to the use of nuclear materials in commercial nuclear power plants that generate electricity. Its regulations are based on sound science to make determinations that adequate protection of the public and the environment is maintained. As part of its responsibility, NRC requires plant operators to have effluent and environmental monitoring programs to ensure that the impacts from nuclear plant operations are minimized. The results of this monitoring have shown the presence of natural and weapons fallout radiation and in a few instances, very low levels of radioactive material of nuclear plant origin. A number of studies by the Radiation Public Health Project1 assert that levels of radioactive strontium-90 (Sr-90) are rising in the environment and that these increased levels are responsible for increases in cancers, particularly cancers in children, and infant mortality. The group claims that radioactive effluents from nuclear power plants are directly responsible for the increases in Sr-90. In one study, researchers reported that Sr-90 concentrations in baby teeth are higher in areas around nuclear power plants than in other areas. This has sometimes been referred to as “The Tooth Fairy Project.” However, numerous peer-reviewed, scientific studies do not substantiate such claims. Strontium is a silvery-white alkaline earth metal that exists in several stable and unstable or radioactive isotopes (Sr-89 and Sr-90). Strontium-90 is a radioactive isotope that is produced in nuclear fission–splitting of an atom’s center that releases energy– and has a half-life (decay of half its radioactivity) of about 28 years. In the United States, the primary pathway for Sr-90 to enter the body is through ingestion of contaminated foods and cow’s milk. 3) radioactive releases from nuclear power plants into the environment. By far, the largest source of Sr-90 in the environment (~99%) is from weapons testing fallout. Approximately 16.8 million curies of strontium-90 were produced and globally dispersed in atmospheric nuclear weapons testing until 1980 (UNSCEAR 2001)2. With a 28 year half-life, Sr-90 still remains in the environment at nominal levels. Numerous measurements were made during weapons testing which found that the worldwide average radiation dose from ingesting Sr-90 (1945 to present) is 9.7 millirem (about equal to radiation doses from a transpolar flight), and the dose from inhaling strontium-90 (1945 to 1985) is 0.92 millirem (about equal to the dose from an arm or leg x-ray). These doses are well below those doses known to cause any effects on health (NCRP 1991)3. The doses from Sr-90 in the environment are about 0.3% of the average annual dose a person in the United States receives from natural background radiation (~300 millirem). As a result of the Chernobyl accident, approximately 216,000 curies of Sr-90 were released into the atmosphere. An increase in the incidence of childhood thyroid cancer in the area directly affected by the accident has been attributable to radioiodine ingestion. No other increase in overall cancer incidence or mortality has been observed that can be attributed to radiation from the accident (UNSCEAR 2000)4. The total annual release of strontium-90 into the atmosphere from all 103 commercial nuclear power plants operating in the United States is typically 1/1000th of a curie. (NUREG/CR-2907, Vol. 12)5. At an individual nuclear power plant, the amount of Sr-90 is so low that it is usually at or below the minimum detectable activity of sensitive detection equipment. Radiation doses from Sr-90 to individuals living within 30 miles of a nuclear power plant would be a tiny fraction of less than one millirem. As indicated above, nuclear power plant emissions of Sr-90 are inconsequential compared with other man-made sources and, thus, it is reasonable to conclude that the vast majority of Sr-90 that can be detected in, for example, baby teeth would be attributable to fallout from nuclear weapons testing or, possibly, the Chernobyl accident. Sr-90, if ingested, tends to mimic calcium when it is in the body and therefore becomes concentrated in calcified tissues such as bones and teeth. If ingested in quantities that produce very large radiological dose rates (about a thousand times higher than doses we all receive from natural radiation), Sr-90 is known to increase the risk of bone cancer and leukemia in animals, and is presumed to do so in people. Below these doses, there is no evidence of excess cancer [Raabe 1994]6. The NRC has established strict limits on the amount of radioactive emissions allowed to be released from nuclear plants to the environment and the resulting exposure for members of the public and the plant workers. (NRC requirements are in Title 10 of the Code of Federal Regulations, Part 20, Appendix B, http://www.nrc.gov/reading-rm/doc-collections/cfr/part020/part020-appb.html). The concentration of radionuclides that may be released is limited to levels which, if inhaled or ingested continuously over the course of a year, would produce a dose of no more than 100 millirem. These limits are based on radiation protection recommendations of both the National Council on Radiation Protection Measurements and the International Commission on Radiological Protection organizations resulting from ongoing research. Nuclear power plants are further limited by their license conditions to keep radioactive material in effluents “as low as reasonably achievable” so that dose criteria for releases to unrestricted areas are five millirem for releases into the air and three millirem for liquid releases. All power plant operators are required to monitor radioactive airborne and liquid discharges from the plant and to file a report of these discharges annually with the NRC. These reports, which are publicly available, list the radioactive isotopes released, the quantity released and the radiation dose to the public. The concentrations of radionuclides released into the environment from a nuclear facility are generally too low to be measurable outside the plant’s boundary. For this reason, any Sr-90 detected in areas near a nuclear power plant would not likely have come from the plant, but would be attributed to fallout from nuclear weapons testing or from the Chernobyl accident. In addition to limits on effluent releases, plant operators maintain an environmental monitoring program that is reviewed and inspected regularly by NRC to ensure compliance with its requirements. To demonstrate that the plant is within the regulatory limits, operators regularly sample and analyze the surrounding soil, vegetation, cow’s milk, and water. In a given year, a plant operator samples and analyzes hundreds of environmental samples. The results of environmental monitoring and assessment efforts are provided to the NRC in an annual report, which is available to the public. It is reasonable to conclude that Sr-90 would be seen in the environment well before it is seen in baby teeth. In order for it to be in the environment from nuclear power plants, it would have to be seen in significant quantities in the effluent stream from these facilities. However, Sr-90 is not present in the effluents at such levels. In 1990, at the request of Congress, the National Cancer Institute7 conducted a study of cancer mortality rates around 52 nuclear power plants and 10 other nuclear facilities. The study covered the period from 1950 to 1984, and evaluated the change in mortality rates before and during facility operations. The study concluded there was no evidence that nuclear facilities may be linked causally with excess deaths from leukemia or from other cancers in populations living nearby. In June 2000, investigators from the University of Pittsburgh8 found no link between radiation released during the 1979 accident at Three Mile Island power plant and cancer deaths among nearby residents. Their study followed 32,000 people who lived within five miles of the plant at the time of the accident. The Connecticut Academy of Sciences and Engineering9, in January 2001, issued a report on a study around the Haddam Neck nuclear power plant in Connecticut and concluded radiation emissions were so low as to be negligible. The American Cancer Society10 in 2001 concluded that although reports about cancer clusters in some communities have raised public concern, studies show that clusters do not occur more often near nuclear plants than they do by chance elsewhere in the population. Likewise, there is no evidence that links Sr-90 with increases in breast cancer, prostate cancer, or childhood cancer rates. Radiation emissions from nuclear power plants are closely controlled and involve negligible levels of exposure for nearby communities. Also in 2001, the Florida Bureau of Environmental Epidemiology11 reviewed claims that there are striking increases in cancer rates in southeastern Florida counties caused by increased radiation exposures from nuclear power plants. However, using the same data to reconstruct the calculations on which the claims were based, Florida officials were not able to identify unusually high rates of cancers in these counties compared with the rest of the state of Florida and the nation. In 2000, the Illinois Public Health Department12 compared childhood cancer statistics for counties with nuclear power plants to similar counties without nuclear plants and found no statistically significant difference. Interpreting measurements of radioactive material in people is difficult unless one knows what each individual was exposed to, when the exposures occurred, and by what routes they occurred (ingestion, inhalation, etc.). In particular for Sr-90, dietary contributions from foodstuffs produced out of the region must be considered. Also, fallout in soil across the U.S. is not uniform. Rainfall, wind direction and soil composition all affect the levels of Sr-90 in soil. Finally, migration must be accounted for, because people may have lived and acquired radionuclides from a number of geographic locations that are not near a nuclear power plant. In addition, radioactive substances may come from a variety of sources. In the case of Sr-90, the primary source has always been fallout from atmospheric weapons tests (UNSCEAR 2001). Authors of the Radiation Public Health Project reports have stated or implied that claimed statistical associations between cancer rates and reactor operations are cause-and-effect relationships. However, statistical association alone does not prove causation, and well-established scientific methods must be used to determine that for two things that appear to be associated over time, it can be concluded that one causes the other. A simple example helps illustrate this point. A college professor gives the following example of a causal inference: “In the winter I wear boots. In the winter I get colds. Therefore, boots cause colds.” A strong statistical association exists between wearing boots and the health effect of colds. There is, however, an argument about whether boots cause colds. There are principles of good science that are recognized by the scientific community such as whether a study can be replicated; whether it has considered all data or was it selective (e.g., in the population or in the years studied); whether a study evaluated all possible explanations for the observations; was the data used evaluated for validity and reliability; and whether the study’s conclusions were subjected to independent peer review, evaluation and confirmation. used an incorrect half-life for Sr-90 which gives a false impression that strontium levels in the environment are decaying more rapidly than in baby teeth. The evaluation of health effects from exposure to radiation is an ongoing activity of the NRC’s involving public, private and international institutions. The NRC routinely seeks out new scientific information that might reveal health and safety concerns. It reviews independent studies of nuclear safety issues and embraces opportunities to inform the public about the results of such reviews. Based on all the preceding discussion, NRC finds there is little or no credibility in the studies published by the Radiation Public Health Project. The Radiation Public Health Project (RPHP) has conducted a number of studies claiming radioactive strontium-90 (Sr-90) in the environment is responsible for increases in cancers. One of the RPHP’s studies, sometimes referred to as the “Tooth Fairy Project,” reported that Sr-90 concentrations in baby teeth are higher in areas around nuclear power plants than in other areas. Numerous peer-reviewed scientific studies do not support the RPHP’s claims. NRC finds there is little or no credibility in the RHP’s studies. Approximately 99% of Sr-90 in the environment came from atmospheric testing of nuclear weapons. The second largest source of Sr-90 in the environment was the Chernobyl accident. The amount of Sr-90 from all commercial nuclear power plants is a tiny fraction of the amount from Chernobyl. The estimated radiation dose from all sources of Sr-90 in the environment is approximately 0.3% of the dose that the average person in the United States receives from natural background radiation. These dose levels are well below the levels that are known to cause any health effects. The NRC requires nuclear power plant licensees to monitor the releases of radioactivity from their facilities to the environment and to annually report these releases to the NRC. Additionally, these licensees are required to monitor the environment around their facilities and report results annually to NRC. The NRC routinely inspects these aspects of nuclear power plant licensee performance. 1. J. M. Gould, E. J. Sternglass, J. D. Sherman, J. Brown, W. McDonnell, and J. J. Mangano, 2000. “Strontium-90 in Deciduous Teeth as a Factor in Early Childhood Cancer.” International Journal of Health Services. Vol. 30, No. 3; and Mangano, J. et al., 2003 “An Unexpected Rise in Strontium-90 in US Deciduous Teeth in the 1990s.” The Science of the Total Environment, Elsevier Press. 2. United Nations Scientific Committee on the Effects of Atomic Radiation (UNSCEAR), 2001. Sources and Effects of Ionizing Radiation: UNSCEAR 2000 Report to the General Assembly, with Scientific Annexes. Vol. I: Sources. United Nations, New York. 3. National Council on Radiation Protection and Measurements (NCRP), 1991. Some Aspects of Strontium Radiobiology. Report No. 110, NCRP Publications, Bethesda, Maryland, 1991. 4. United Nations Scientific Committee on the Effects of Atomic Radiation (UNSCEAR), 2000. Sources and Effects of Ionizing Radiation, Vol. 1: Sources. United Nations, New York. 5. U.S. Nuclear Regulatory Commission (NRC), 1991. NUREG/CR-2907, Vol.12. Radioactive Materials Released from Nuclear Power Plants, Annual Report. 6. O. G. Raabe, 1994. “Three-Dimensional Models of Risk From Internally Deposited Radionuclides.” Chapter 30 in Internal Radiation Dosimetry, ed. O. G. Raabe, pp. 633-658. Medical Physics Publishing, Madison, Wisconsin. 7. National Cancer Institute (NCI), 1990. Cancer in Populations Living near Nuclear Facilities. Bethesda, Maryland. 8. University of Pittsburgh, June 2000. 9. Connecticut Academy of Science and Engineering, Spring 2001. Bulletin of the Connecticut Academy of Science and Engineering, Volume 16.2. 10. American Cancer Society (ACS), 2001c. “1998 Facts & Figures. Environmental Cancer Risks.” Accessed online: http://www.cancer.org/statistics/cff98/enviromental.html . 11. Florida Department of Health (FDOH), July 17, 2001. Report Concerning Cancer Rate in Southeastern Florida. Bureau of Environmental Epidemiology, Division of Environmental Health, Tallahassee, Florida. 12. Illinois Department of Public Health, Fall 2000. Health and Hazardous Substances Registry Newsletter, Illinois Department of Public Health, Division of Epidemiologic Studies, 605 W. Jefferson St., Springfield, Illinois. Eisenbud, M., 1987. Environmental Radioactivity, 3rd Edition. Academic Press, San Diego, California. Federal Focus Inc., 1996. Principles for Evaluating Epidemiologic Data in Regulatory Risk Assessment. Developed by an Expert Panel at a Conference in Long, England, October 1995. Available at http://www.pnl.gov/berc/epub/risk/index.html . Federal Focus, Inc., Washington, D.C.
Gawande, A., 1999. “The Cancer-Cluster Myth.” The New Yorker LXXIV(45):34-37. Georgia Department of Human Resources (GADOH), Division of Public Health, Epidemiology and Prevention Branch, Perinatal Epidemiology Unit, 1997. The Challenge of Change: A Mid-Decade Look at Maternal and Child Health in Georgia, Publication Number DPH97.53HW. Hill A. B., 1965. “The Environment and Disease: Association or Causation?” Proceedings of the Royal Society of Medicine 58:295-300.
International Commission on Radiological Protection (ICRP), 1991. “1990 Recommendations of the International Commission on Radiological Protection.” (ICRP Publication No. 60) Annals of the ICRP 21(1-3), Pergamon Press, New York. National Cancer Institute (NCI), 2001. “Is There a Cancer ‘Epidemic’?” Accessed online: http://press2.nci.nih.gov/sciencebehind/cancer/cancer62.htm . National Council on Radiation Protection and Measurements (NCRP). 1993. Limitation of Exposure to Ionizing Radiation. Report No. 116, NCRP Publications, Bethesda, Maryland. National Research Council, 1990. Health Effects of Exposure to Low Levels of Ionizing Radiation (BEIR V). National Academy Press, Washington, D.C. Neutra, R. R., 1990. “Counterpoint from a cluster buster.” Am. J. Epidemiol. 132(1):1-8. Norman, G. and D. Streiner, 2000. Biostatistics. BC Decker, Inc. Hamilton, Ontario, Canada. Omenn, G. S., A. C. Kessler, N. T. Anderson, P. Y. Chiu, J. Doull, B. Goldstein, J. Lederberg, S. McGuire, D. Rall, and VV. Weldon, 1997. Framework for Environmental Health Risk Management. Final Report, Vol. 1. U.S. Government Printing Office, Washington, D.C.
Reynolds, P., D. F. Smith, E. Satariano, D. O. Nelson, L. R. Goldman, and R. R. Neutra, 1996. “The Four County Study of Childhood Cancer: Clusters in Context.” Statistics in Medicine 15(7-9):683-697. Sturgeon, S. R., C. Schairer, M. Gail, M. McAdams, L. A. Brinton, and R. N. Hoover, 1995. “Geographic Variation in Mortality from Breast Cancer among White Women in the United States.” Journal of the National Cancer Institute. 87:1846-1853. U.S. Environmental Protection Agency (EPA), 1987. “Radiation Protection Guidance to Federal Agencies for Occupational Exposure.” Federal Register 52(17):2822-2834. Ukraine’s Acting Foreign Minister Volodymyr Khandohiy has met with Russian Foreign Minister Sergei Lavrov on the sidelines of a meeting of foreign ministers of the OSCE member-states on the Greek Island of Corfu on Sunday. The parties exchanged opinions concerning the talks on the delimitation of the Sea of Azov, the Black Sea and Kerch Strait with regard to the results of the 31st round of meetings of the delegation of Ukraine and Russia, which took place in Moscow on June 16-17, the Ukrainian Foreign Ministry’s press service said. Besides, Khandohiy and Lavrov discussed the preparations to another meeting of the heads of the two states’ foreign ministries with the participation of governors of border regions, representatives of ministries and agencies of the two states slated for this year in Kharkiv. The ministers also spoke about holding the third meeting of the subcommittee for international cooperation of the Ukrainian-Russian interstate commission. In the conflict-prone Caucasus, concern is mounting about a security vacuum following the end of the UN and OSCE’s observer missions. Just 200 EU monitors are left, and they’re facing a volatile situation. Territorial tensions in the Caucasus have a long and tangled history, but since the break-up of the Soviet Union, Russia and Georgia have been repeatedly at odds over the breakaway regions of South Ossetia and Abkhazia. It’s not surprising, then, that several international observer and military missions have been active in the region. The Organization for Security and Cooperation in Europe (OSCE) has had a mission in Georgia since 1992 to promote negotiations between conflicting parties and reach a peaceful political settlement. A former head of the armed forces has questioned the government’s plan to build two large aircraft carriers for the navy, now estimated to cost £5bn, and made clear that in his view the country could not afford them. Lord Guthrie, chief of defence staff when Labour came to power in 1997, described the two ships – which would be the biggest the navy has had – as “enormously expensive”. A leaked memorandum by the consortium that would build the ships revealed on Monday that they were already running £1bn over budget, a 25% increase on the original estimated cost of £3.9bn. Guthrie was speaking at the launch of a report of the Institute for Public Policy Research thinktank’s national security commission. A fresh defence review would have to consider the whole range of military capabilities, including whether the army had too many tanks and not enough “boots on the ground”, he said. “If we are more likely to be involved in counter-insurgency than during the cold war, then presumably people are needed more than bombs,” he added. Lord Ashdown, former Liberal Democrat leader and a chairman of the IPPR commission, said Nato-led forces in Afghanistan were losing the struggle against the Taliban. He said it was a scandal that British troops were dying because of a failure of international co-ordination. The IPPR report says Britain can no longer afford to deliver a “full spectrum”. It says Britain should maintain a “minimum credible independent nuclear deterrent”, adding that a decision about replacing the existing fleet of Trident submarines need not, and should not, be taken until 2014. Moscow sees the Caucasus mountains area as a strategically vital zone, the approach to prime agricultural and industrial regions and an important energy transit route. The Kremlin views any challenge here as a threat to the overall security and unity of a vast country stretching from the Baltic to the Pacific. A senior Russian general said the manoeuvres would involve Russian troops stationed in the Georgian breakaway regions of South Ossetia and Abkhazia, though the extent of their participation was not clear. Similar Russian exercises in the same region last August allowed Moscow to send troops and tanks into Georgia quickly to repel government troops who tried to retake South Ossetia. The brief war raised fears in the West over security of gas transit routes from the Caspian Sea to western Europe. The manoeuvres will involve 8,500 military personnel, 200 tanks, 450 armoured vehicles and 250 pieces of artillery. Russian President Dmitry Medvedev criticised NATO for holding exercises close to the war zone in Georgia in May, saying they fuelled tension in the region. An annual event, the Russian exercises were planned before the NATO war games. “We are holding these exercises to boost the country’s defence where it is being threatened,” Dmitry Rogozin, Russian envoy to NATO, said in a video link with Moscow journalists. The exercises will include “drills by troops simulating a tense situation gradually escalating from a crisis into an armed conflict,” the Defence Ministry said. “The fact that the exercises are held not just on Russian territory, but on Georgia’s occupied territory, with the participation of thousands of soldiers and the involvement of so much military hardware, makes this situation even worse,” he told Reuters. The Russian exercises — which will include anti-terrorism drills — were launched two days after NATO and Russia resumed formal cooperation for the first time since last August’s war. Russian forces have largely quelled a rebellion in the region of Chechnya after two wars, but rebels launch sporadic attacks there and in the neighbouring areas of Ingushetia and Dagestan. Last week the Kremlin-appointed president of Ingushetia, Yunus-Bek Yevkurov, was severely wounded in an assassination attempt claimed by a Chechen group. He did not say what part they would play.